With the completion of the East Hawaiʻi transmitter project, HPR is finally able to fulfill its founding mission of providing two discrete program streams to the entire state. Everything you need to know about the February 14th realignment in the links below. Get updates on programming and events. Stay close to your station! Give us a call at (808) 955-8821, during business hours. We'll be happy to help you find your program and/or take other questions/comments. 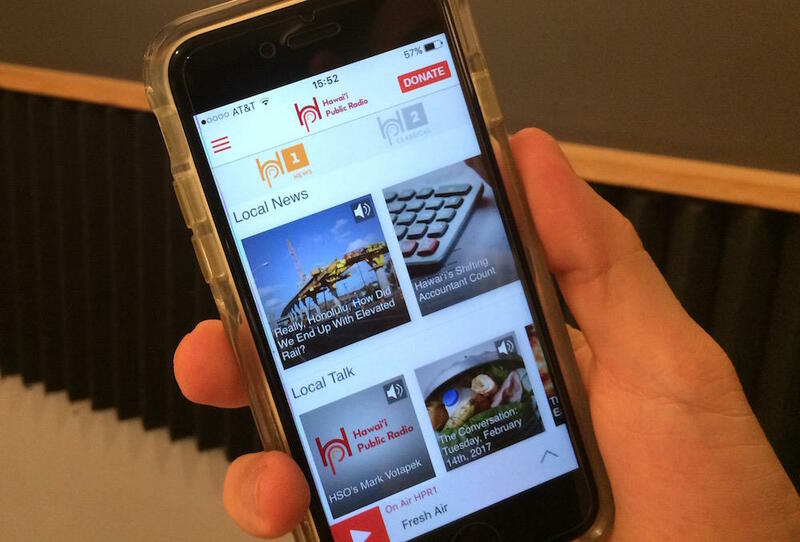 Hawaiʻi Public Radio has unveiled a new and improved smartphone app which coincides with the HPR Program Realignment. The new platform offers live streaming of both HPR-1 and HPR-2, as well as on-demand content. Listeners can also share local news stories or NPR content, find program schedules, even make donations to the station. Search for it on the App Store (iOS devices) or Google Play (Android) under "hpr." The app is free to download. See FAQs about our mobile app. This new visual is a re-voicing of HPRʻs enduring qualities. After 35 years, HPR has established roots in its community. Enfolded in the public's trust and support, we reach out to bridge that which divides and stand ready to embrace the future. Our simple sound waves bring the world to Hawaiʻi and Hawaiʻi's stories to the world. WeAreHPR.